Do you want to see the game in action? Don't miss our Twitch Stream at 12 AM GMT / 8PM EDT / 5 PM PDT on our official Twitch Channel! 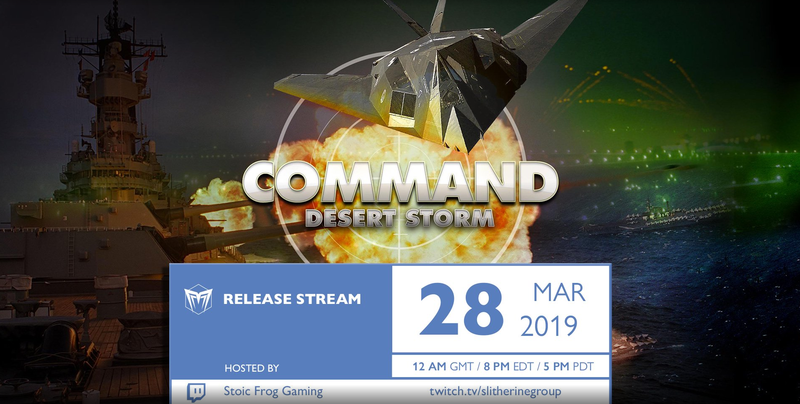 The new “Desert Storm” DLC is now well into production, and is set to launch on March 28. The companion v1.15 update has also been released, and the dev team is already tweaking the new features and fixing issues based on early feedback. Let us take a look through the scenarios available in this battleset and explore the historical and hypothetical events that it surveys. On August 2, 1990, the world watched in stunned surprise as Iraq’s elite armor divisions invaded and conquered Kuwait within two days. This irrevocable act was the culmination of years of disputes between the two states. During the Iran-Iraq war, Kuwait had made a series of large loans to Iraq totaling over $14b. By the war’s end in 1988, Iraq was unable to repay and repeatedly asked Kuwait to forfeit the debt, arguing that by standing up to Iran it had indirectly protected the small, wealthy state. Furthermore, Iraq accused Kuwait of “drinking its milkshake”, i.e. using slant-drilling techniques to exploit oil reserves from the Iraqi portion of the rich Rumaila field. The US administration, balancing between its long-standing allies Saudi Arabia and Kuwait, and its desire to continue using secular Iraq as a bulwark against fundamentalist Iran (as it had done throughout the 1980s), had long been trying to mediate a solution that would placate all sides. During the spring and summer of 1990, Iraq’s military preparations were closely observed by western intelligence but were interpreted as a show of force designed to intimidate Kuwait and third-party negotiators rather than as the prelude to action. On July 25, the US ambassador met with Iraq’s leader, President Saddam Hussein, to reaffirm that (a) the US was committed to a peaceful resolution of the disputes between the two states and (b) that they held no opinion or favor towards either side in the disputes themselves. Hussein apparently interpreted the former as a token statement and the latter as a tacit approval of his regional ambitions. He thus finalized his operational plans and, just one week later, set them in motion. The US Central Command (CENTCOM) had long-prepared plans for the rapid transfer of heavy US forces in the Middle East and Arabian peninsula. The concept of the Rapid Deployment Force (RDF) postulated a sudden threat to the oil fields of Iran or Saudi Arabia, in both cases from a sudden Soviet invasion out of Afghanistan or the Caucasus TVD. To counter such a threat, multiple rapid-reaction forces and schemes were put in place: Elements of the 82nd Airborne Division were on a constant two-hour alert, with a brigade-size commitment scheduled 18 hours later; division-sized army forces were to be airlifted and delivered within 2 weeks; multiple container ships pre-positioned in the Persian Gulf and Indian Ocean carried supplies to be used by the arriving troops; multiple tactical and strategic airwings were earmarked for immediate relocation, and more. CENTCOM regularly practiced these plans in concert with regional allies, e.g. the bi-annual “Bright Star” exercises held in Egypt. Though nobody on the ground yet knew it, all these plans and preparations were about to be put to the real test. Emboldened by his army’s swift success in conquering Kuwait and its oil fields, Saddam Hussein considered a possible advance into Saudi Arabia. US reinforcements had already started pouring into the country, but slower than required, because the Saudi monarch was unconvinced that Iraq would invade (Saddam had privately assured the Saudis that Kuwait was his sole objective). A massive global air/sea-lift operation was well underway, but forces and supplies were by necessity streaming in piecemeal and simply getting the right people and hardware where they needed to be was challenging. In many ways, the rapid-reaction force being assembled in Saudi Arabia during August & September was a rag-tag motley crew of assets. Opposite them, just across the border stood Iraq’s best armored units, flush with confidence, ready to advance on a moment’s notice. If that armored fist had crossed the border, would the thin red line have held? Two Soviet generals sit at a café in Paris, watching the Red Army’s victory parade. One of them turns to the other and asks: “By the way, comrade, who won the air war”? This grim joke, popular in NATO circles in the 1970s and 80s, reflected a common prevailing wisdom distilled from the lessons of WW2, Korea and Vietnam: Airpower alone had never been able to decisively determine the course of a war. The potential of airpower as a paradigm-shifting strategic weapon had been evident since its inception. Capable of bypassing the front lines to strike at the enemy’s heartland, it might end wars in days, rather than the years of brutal front-line attrition required in past conflicts. A century of failed attempts dispelled the dream; the reality was an attritional war of fighters and flak (and more recently SAMs), as bloody as anything earthbound. The same applied to direct destruction of fielded enemy forces; airpower was important, but as plenty of experience attested, never dominant. As the US-led coalition air forces prepared for their first round of offensive operations against the Iraqi military, a lot was riding on the men and machines tasked with the job. The machines themselves were a mix of old and tried, and new and untested. The US military still lied in the shadow of the failures of Vietnam, where “a thousand tactical victories” had nevertheless ultimately resulted in strategic and political defeat. The directives from the highest level were clear as crystal: This would not be allowed to turn into another Vietnam. Strategic victory had to be achieved swiftly, massively and decisively – in other words, unlike any previous major conflict the US and its allies had ever fought. Some students of airpower pointed to Israel’s swift victory in 1967 (and especially the first-day annihilation of the Egyptian air force) as a possible model to emulate. While there was indeed much to learn from the Arab-Israeli conflicts of the past (indeed, Israel’s extensive use of electronic warfare in 1982 did not go unnoticed and was to be intensely replicated), the reality was that the conditions that enabled the IAF to triumph in 1967 had come and gone. Low altitude was no longer a safe sanctuary for strike aircraft; Radars had become more resistant to jamming; Aircraft were no longer parked in long rows in the open begging to be bombed & strafed, each instead now being individually protected by a hardened aircraft shelter (HAS) seemingly impervious to anything but a dead-on nuclear impact. Catching the Iraqi air force on the ground and wiping it out within a few hours was a pipe dream. The Iraqi integrated air defence system (IADS), an odd mix of Soviet-supplied radars and SAMs together with a backbone of mostly French-originated command, control and communication infrastructure (a detail that turned out to be eminently exploitable) appeared to be a very tough nut to crack. Campaign planners, by every right a conservative group, estimated potentially heavy aircraft losses for the first nights of intense airstrikes. Desert Storm would famously prove the “never dominant” claim invalid, but before airpower savaged the Iraqi army itself, it reached one more time for the first and dearest dream – overwhelming and instant strategic supremacy. The first night’s strikes on Iraq proper saw a dizzying ballet of assets, coordinated by modern AWACS and satellite communications, overwhelm Iraq’s air defenses, plaster its airbases and hammer its C3 infrastructure – simultaneously. Assets ranging from fighters and bombers to attack helicopters to drones to cruise missiles struck their targets with impunity, but none more boldly than the F-117s which braved Baghdad itself, hit their targets, and returned without loss. To what extent those first-night strikes realized the traditional goals of strategic airpower – especially the shattering of enemy morale – is a question still debated and might never be truly answered. But one promise, beyond a shadow of a doubt, had finally been realized: At long last, the bomber had gotten through. Prior to Iraq’s invasion of Kuwait, it had been established that Iraq possessed a significant chemical weapons capability. Iraq’s military had used chemical weapons on numerous occasions against Iran, as well as various rebel groups such as in Kurdistan. By the time of the coalition build-up during Desert Shield, the consensus of western intelligence agencies held that Iraq still had a sizable chemical arsenal, had likely forward-deployed these weapons, and was prepared to use them against coalition forces. The concern about Iraq using WMDs as a counter to the coalition’s superiority in conventional forces prompted numerous US officials to implicitly or even explicitly state that the US would respond to such an attack with WMDs of its own, probably employing tactical nuclear weapons. At the tactical and operational level, Iraq’s chemical weaponry constituted one of the prime strategic targets of coalition air power. The effort to neutralize it was two-pronged: chemical agents still stored in their rear-area bunkers were attacked before they could be deployed; and ready-forces already outfitted with chemical warheads (Scud missile batteries, artillery units, etc.) were prioritized by coalition airpower. But as frequently happens with such plans, the best efforts still resulted in misses and leakers. On January 18, the second day of Desert Storm, Iraq’s President Hussein – dismayed by Iraq’s inability to resist the coalition’s massive aerial onslaught – conveyed an ultimatum to CENTCOM headquarters: unless coalition forces immediately ceased offensive actions and withdrew from Kuwait, Iraq would strike coalition troops and/or any city of their choice with chemical weapons. Saddam Hussein’s first serious reaction to the commencement of Desert Storm was to unleash a protracted bombardment of Israel (and to a much lesser extent Saudi Arabia) using Iraq’s considerable arsenal of SS-1C Scud-B tactical ballistic missiles (TBMs). While the strikes against Saudi Arabia were merely punitive gestures, attacking Israel was an astute political gambit: if Israel retaliated, as Hussein hoped, reawakened anti-Israel fervor in the various Arab states that had either remained neutral or actively joined the coalition could fracture the alliance mere days into the campaign. CENTCOM planners and Schwarzkopf himself had neglected the Scud threat up to that point, correctly considering the missiles as militarily insignificant without WMD warheads (which the US nuclear deterrent would preclude.) Though tactically and operationally ineffective, they had suddenly become a serious strategic/diplomatic threat. Persuading Israel to hold back was no easy task, again demanding multiple parallel measures. First, several Patriot batteries with PAC-2 missiles (optimized for TBM engagements) were hurriedly deployed to key Israeli target areas like Tel Aviv. Secondly, Iraq’s TBMs and launchers became priority targets for air campaign planners. The missiles installed in fixed launchers at the large H2 and H3 airbases in western Iraq were straightforward enough to attack; however, most Iraqi Scuds were deployed on highly mobile 8×8 transporter/erector/launcher (TEL) vehicles exploiting the vast Iraqi desert to hide themselves. To destroy them, a large portion of available coalition aircraft and special operation forces (SOF) teams were re-tasked to seeking out and eliminating Scud TELs exclusively. This veritable “needle in a haystack” hunt would become the longest operation of the entire conflict and a maddeningly frustrating. By January 20th, 1991, the initial strikes on Iraq had been highly successful, destroying or degrading much of Iraq’s communication and anti-air capabilities. However, the coalition naval fleets in both the Eastern Med and Persian Gulf had by this point expended most of their long-range land-attack capability. In particular, the Persian Gulf Task Force needed to replenish its stock of Tomahawk cruise missiles as soon as possible. Historically, two Iowa Class battleships, Missouri (BB-63) and Wisconsin (BB-64), played a part in the Gulf War. Four Iowas were built during WWII and two other keels were laid – the Illinois (BB-65) and Kentucky (BB-66). These two hulls were to be the Iowa’s follow-on class, the “Montana Class” battleships. In real life, the end of WWII halted their construction and they were never commissioned. The BB-65 hull was broken up in September 1958. In the 1950s, several proposals were floated to complete the Kentucky as a guided missile battleship. This project was authorized in 1954, and Kentucky was renumbered from BB-66 to BBG-1, only to be canceled later. Conversion of the 73% complete Kentucky would have entailed extensive refits to replace the two original aft 16″ turret barbettes with an assortment of missile launchers and sensor systems. Apart from Phalanx CIWS, quad Harpoon launchers and Tomahawk armored-box launchers received by the four Iowas during their 1980s modernization, the Kentucky would also have room for multiple SM-2 Standard area-defence missile and Sea Sparrow point-defence missile launchers, plus their associated air search and SAM-illumination radars. Its original twin 5-inch gun turrets would’ve been replaced with modern Mk45 guns. If employed correctly, the last of the BBs would have been a fearsome addition to coalition naval power. In this hypothetical scenario, the conversion was completed instead of abandoned, and BBG-1 Kentucky has been commissioned into service, receiving subsequent modernization during the 1980s similr to the Iowas. The Kentucky and her accompanying escorts and supply ships have been tasked to reinforce the Coalition’s naval force in the Northern Persian Gulf and relieve the first-strike shooters. Desert Storm was arguably the strangest war in Israel’s military history. Even though a nationwide state of emergency was declared, and the Israeli Defence Forces (IDF) were put on alert, the order to commence offensive operations never came. Saddam Hussein had attempted to turn Iraq’s dispute with Kuwait into a larger Arab-Israeli matter long before the air campaign started. For example, on August 12, 1990, just ten days after the Iraqi invasion, he had publicly suggested that Iraq might withdraw from Kuwait if Israel withdrew from all occupied Arab territory and Syria withdrew from Lebanon. Unsurprisingly this proposal drew considerable praise from the Arab world, even from principals that were otherwise critical of Iraq and its invasion. Hussein’s order to fire a protracted barrage of Scud missiles against Israel right after the beginning of the coalition air campaign was therefore a step-up in this shrewd political maneuver: he attempted to draw Israel into battle, thus transforming what had started as an Arab-Arab conflict into an Arab-Israeli conflict, one in which Iraq would suddenly find new allies. Realizing this, the US-led coalition urged Israel to “stay down” and take the punches on the chin. It was necessary to keep Israel out in order to keep the Arab states on the side of the coalition. To demonstrate the US commitment to Israeli defence, a number of Patriot missile batteries were hastily ferried to Israel to provide additional ABM cover, and a substantial part of the coalition’s tactical airpower was dedicated to eliminating the Scud threat at its source. The Israeli government understood the stakes and, despite suffering repeated Scud impacts on Tel Aviv and elsewhere, held fast. In this hypothetical scenario, Saddam’s gamble paid off: mounting public pressure in Israel from the relentless Scud bombardment has reached the breaking point. Rumors are spreading that dissident Arab factions within Palestine and the Gaza Strip are assembling material, supplies, equipment and personnel to launch independent attacks against Israel in support of Iraq’s pressure. The government feels that it has to respond, even in a limited fashion, or completely lose legitimacy. Israel’s gloves are about to come off. 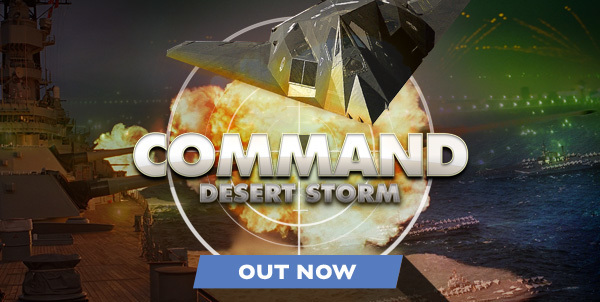 A standalone expansion for Command: Modern Air/Naval Operations, 2013's Wargame of the Year: play as a single, separate game, or add it to your collection of scenarios for CMANO.